The paint on the Tic Tac Turtle Toss mats contains excess levels of lead, violating the federal lead paint standard. The recall involves about 60 vinyl/polyester play mats. The 50-inch double-sided mats have a number design on one side and a turtle design on the other. 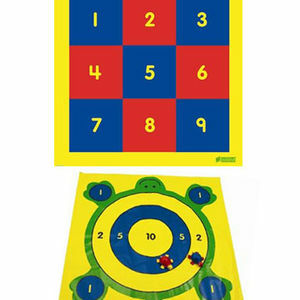 The mats are yellow with numbers and designs painted in red, blue, green, and black. The mat has the Discount School Supply name and logo printed in the corner on both sides of the mat. Bean bags pictured with the mat are sold separately. Discount School Supply catalogs and the company's Web site from June 2007 through September 2007 for about $40. Stop using the mats immediately and contact Discount School Supply to receive a credit or refund. For additional information, contact Discount School Supply at (800) 993-3603 between 6 a.m. and 5 p.m. PT Monday through Friday; visit their Web site at www.discountschoolsupply.com, or e-mail tossrecall@discountschoolsupply.com.